Early math achievement is a better predictor of success in school in general (math, reading, etc.) than early reading! I find this fascinating considering that there is WAY more funding and research of literacy than numeracy. For YEARS, I’ve been saying that numeracy is too important to always be playing second fiddle to literacy – hopefully we’ll see some more support, research and funding. The researchers don’t know why this is the case – but it does indicate that early math achievement leads to stronger executive functioning. Understanding the numerical symbols is very important as is matching the quantity with the numeral. For kindergarten teachers this means students understand that 5 means ‘five’ and means (or any other visual of 5 things). He also pointed out that there is a big difference between knowing how to count and understanding what it means. This is what I’m always talking about – conceptual understanding! Kids can count to 10 often at young ages but they are simply memorizing the words, like words to a song and may not really understand what they mean. Dr. Ansari and his colleagues have created a task that can be used as a screening task for students entering kindergarten and for those who are struggling in later grades. This task involves asking students to give you a certain number of items. For example, they have a bunch of blocks or counters, then you ask them to give you 5 blocks, then 6 blocks, etc. Students who can accurately give you the correct number of blocks have ‘knowership’ up to that number. Children may be able to count fluently but have limited ‘knowership’. This could be a very useful way to start the year – ensuring that those students who don’t yet have ‘knowership’ get the support they need! Another predictor based on evidence is the ability to know which number and quantity are greater (symbolic being a greater predictor of success in future arithmetic tests). There is a FREE screening tool for grades K-3 for just this created by Dr. Ansari here. How Can We Help our Kids Improve? The great news here is that the best ways to improve students’ understanding of symbols and their respective quantities are to play games! 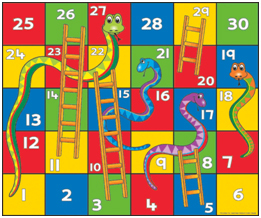 Games that have a linear measurement component like Snakes and Ladders is great. In order for this to be effective, there must be numerals like you see in the image (for younger students just using a number path from 1-10 is great) and the child is moving a game-piece forwards (or backwards). It is the pairing of a linear model, with the numerals that worked the best in the studies. We only use 10% of our brain – this is not true. At All. Different parts of our brain are used differently all the time. When they do brain image scan it doesn’t show what areas of the brain are used (or else it would all lit up) but rather what parts are used MORE than others, thus the smaller highlighted sections. Males are better at math than females. Again, not true at all. All of the evidence suggests there is no difference what-so-ever and so he wonders not only how this myth started but also why it’s still around. There is no evidence to support learning styles. Some skills/concepts are better learned one way or another by most people. There may be some general preferences, like those who like to read rather than hear material but this does not equate to have a learning style. I summarize this as there is more brain activity when a growth mindset person makes a mistake than when a fixed mindset person makes a mistake. The attention to and perception of mistakes (as an important part of learning) is greater in people with growth mindsets. There is evidence that students who feel panicky while doing math perform more poorly than those that don’t and that the areas of the brains that are more ‘lit up’ are the fear centers. Essentially, someone with math anxiety feels the same way when they have to math as I would if I was sitting next to a spider (my heart rate would spike, my palms would sweat, etc.). The research also shows that when this anxiety is happening the processing resources are depleted and thus why people can’t perform that math. Can you recall a time when you went blank on a test, only to panic and then never remember what you knew you knew? Me too. I think this is something we need to share with our students so that we can teach them how to calm their minds and bodies and not end up in that ‘fight or flight’ mode that will make learning or test writing nearly impossible. He also showed the studies that I’ve read before about the correlation between female teacher anxiety and their female students as well as the correlation between parents and their children. One thing I found really interesting was the correlation between parents with high math anxiety who helped their children with math homework – it’s not a good thing! This tells me we need to continue sharing these findings with the parents of the students we teach and promote growth mindset messages at home and at school. This year seems to be especially busy with pro-d sessions that I’m attending as I’m also attending the Aboriginal Math Symposium this week, which I’ve attended for the past 2 years and have always found really valuable. In early June I’m attending the Canadian Mathematics Education Study Group in Squamish, which I’m also really excited about as I’ll be joining a group working on decolonizing mathematics. Finally, I’m excited to let you know that I’ve been accepted into a Post Graduate Certificate Program in Ethnomathematics at the University of Hawaii! I’ll be heading to Hawaii in July but most of the program will be online and I’ll be working within my community to engage in place-based math problem solving with local environmental, ecological or economic problems as our starting point. I will be sure to share with you all summaries of what I’m learning and how you might be able to implement the ideas in your own classrooms.